Last Saturday night we went iceskating downtown with good friends and then we all headed home for a Chipotle inspired feast. Since we were coming straight from skating I wasn't going to have time to prep dinner so I made Barbacoa in the crockpot that morning and assembled my salsas, guacamole, and other accompaniments the night before. It was awesome to walk in from the cold snowy night and be greeted by the savory scent of the hot dinner that was readily awaiting our return. 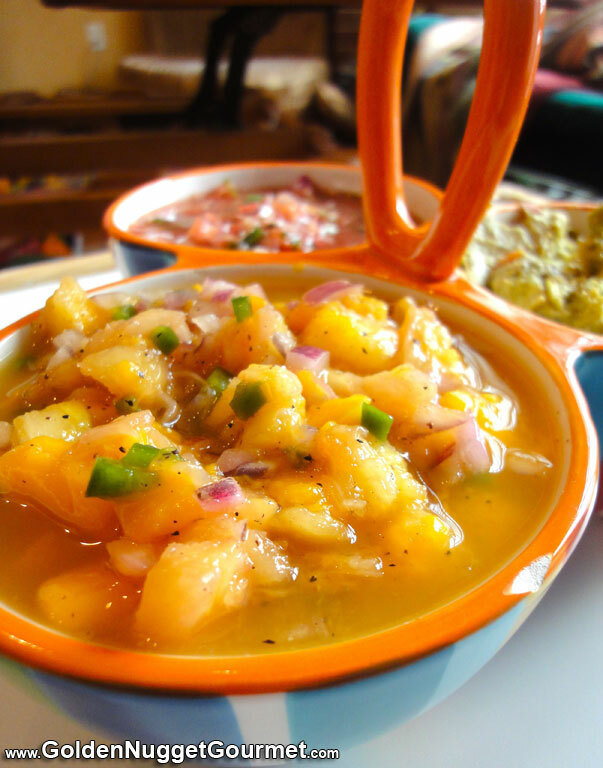 The combination of this sweet pineapple-mango salsa on a salty tortilla chip is absolutely addicting. Making it the night before allows for all of the flavors to really meld together.